"He possessed in an eminent degree the spirit of prayer, and employed several hours of the day and of the night in contemplation"
Borromea (1538-1584) was born to a wealthy, noble family. He was a lawyer, cleric, abbot, prior and cardinal and was known as the apostle to the Council of Trent. Due to his enforcement of strict ecclesiastical discipline, some disgruntled monks in the Order of the Humiliati hired a lay brother to murder him on the evening of 26 October 1569; he was shot at, but was not hit. He worked with the sick and helped bury the dead during the plague outbreak in Milan in 1576. 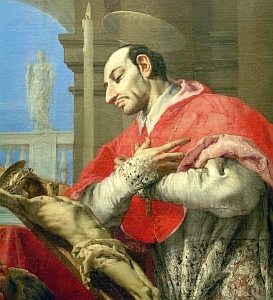 Borromeo spent his life, and his fortune, in the service of the people of his diocese. He directed and enforced the decrees of the Council of Trent, fought tirelessly for peace in the wake of the storm caused by Martin Luther, founded schools for the poor, seminaries for clerics, hospitals for the sick, conducted synods, instituted children‘s Sunday school and worked among the sick and dying. He is patron against abdominal pain, against stomach diseases, against ulcers and patron for apple orchards, bishops, catechists, catechumens, spiritual directors & starch makers.